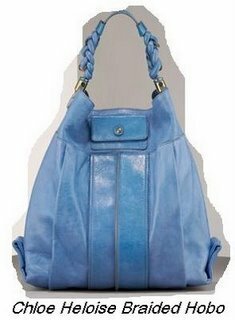 This is a fabulous looking handbag! The Chloé Heloise Braided Hobo is available in nutmeg brown and a wonderful shade of light blue. The leather purse is both practical and chic in design and will appeal to a broad range of tastes and ages. This roomy 16 x 14 x 5.5 bag would look just as good on the shoulder of a 20 yr old with downtown style as it would on a 40-something suburban mom. The supple lambskin leather exterior begs to be touched yet is sturdy enough to take a beating. The braided handle, pleated detailing and convenient front flap snap pocket are visually tempting without being overly trendy. The result is a hobo that works well any time of day and any time of year. A modern, stylish bag that's a solid investment - just what we're all looking for.